The Catherine Wheel is the last book I needed to read (except for the Lorac which is unbuyable) to prevent spoilers when reading Noah Stewart’s post on various gambits in GAD fiction. This impromptu project was quite fun and the reading of the post was, too. I’m not sure, given how my brain works, whether these will stick with me or not, but I definitely recognized that I have fallen for an old gag multiple times. This post will be somewhat spoilery, too, I expect, but I will try to vague it up. Reading the comments is another set of books you should read if you want your GAD books unspoilt. Mostly Christie, I think. Probably best to read all of Christie, but especially ABC Murders. 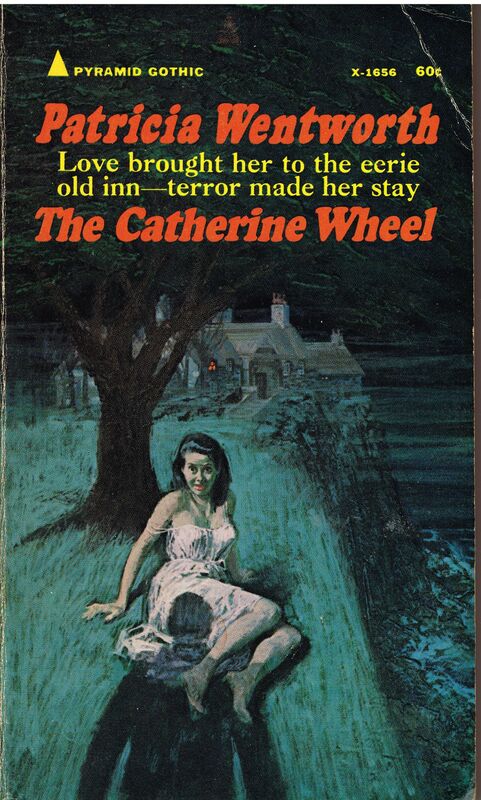 The Catherine Wheel is the third Patricia Wentworth on the list and starts off a little different. An old man with plenty of money and no immediate family advertises to meet his extended family. The grandchildren of his aunts and uncles – so, the next generation – for purposes to be named later. Curiosity and hope of game lure 8 cousins out to an old family inn, The Catherine Wheel, where they all convene for a weekend of country air, food and wine, and murder…. Miss Silver is given an odd assignment to barge in on this little family party to find out if anyone is still smuggling from this inn – a grand old family tradition. And barge she does. And she does a real job of investigating this time and coming up with the vital points to crack the case. Just tried to post this whole thing and lost half of it, but gained a picture of this tired bunny. Maybe if I feel like it, I will try to recreate the end of this post, but not now. I am just like this bunny. I found it amusing. She did not come to the inn for love, she came because her newly found great-uncle offered a hundred pounds to do so for the weekend, same as the rest of this blood-isnt-really-thicker-than-water family. I talked about the solution not being fair. Miss Silver tells you various things along the way and a couple of them are super-improbable. The first you can swallow because those who ought to know better have reasons for not letting on. Then, well, I can’t say, but I found a second aspect of this crime really impossible to believe and given the way a certain person behaved they’d all been a lot better off if they’d done them in instead. Anyhoo, the gambits. Already blurred in my mind, I will presumably fall for most of them over and over again. A lot of mistaken identities. A killed instead of B. A killed on purpose, but everyone’s supposed to think B was the intended victim. You’re probably going to want to read the comments, too, and it would be good before you do to have read Christie’s ABC Murders as well. The Sound of Murder gambit is one I’ve experienced and seen through in the last year, but it didn’t help with solving the mystery. It was a red herring. There are a number of mysteries that rely on people looking so much alike that no one can tell them apart. A premise I almost always grind my teeth over. I can’t see them, can I? Not fair at all. Unless they give other non-visual clues that you should be able to guess. Unless the people are nearly strangers, someone is going to be able to tell them apart. I was going to say or the body is disfigured completely, but that still leaves the other person pretending to be someone they’re not. I imagine that would be very difficult to do unless they were known for never talking about themselves. Hard to make up a whole life. I also think the Elisabeth of Austria gambit or the Sissi gambit as I’d prefer to call it – named after the Empress of Austria who, stabbed by an anarchist, said he didn’t hurt me, walked back to her boat under her own steam, lay down for a nap and died – while it is actually possible to happen in real life is completely unfair in fiction unless someone tells that story or one similar early on so you know it’s a possibility. Even then I’m not sure it isn’t cheating. At any rate a fun idea and I’d encourage you to read the post if you’re well up on your GAD fiction and maybe contribute one Noah forgot.